Check out this ultra-early, ultra-exciting 1965 LARGE ART Daredevil battle page! This page is just the SECOND time Romita ever drew (over Jack Kirby's layouts) an interior comic book page for Marvel Comics! This issue predates Romita's start on Amazing Spider-Man by 6 MONTHS! 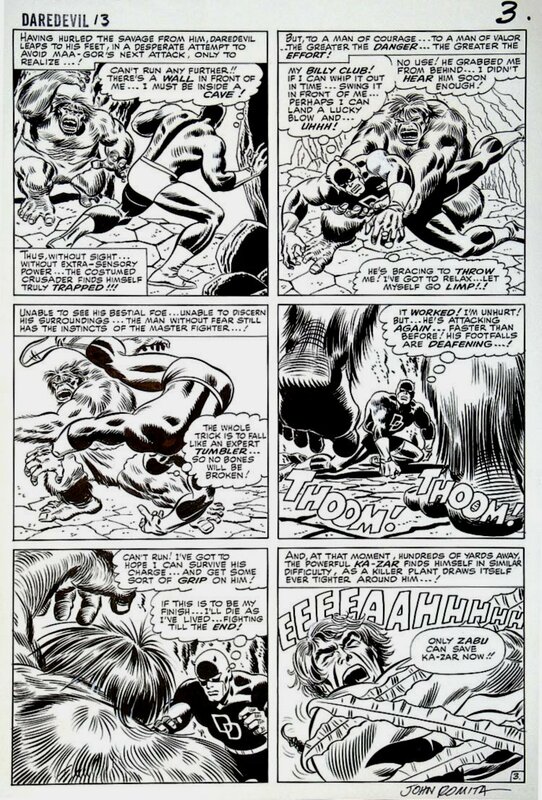 This page features Daredevil in all out battle in 5 of 6 panels exhibiting the courage that dubbed him the "Man Without Fear" as he fearlessly squares up against a prehistoric Hulk-like barbarian. The last panel shows Ka-Zar in a pickle of his own within the Savage Land setting of this storyline. This is a VERY early, VERY HISTORIC John Romita LARGE ART DAREDEVIL BATTLE PAGE that should not be passed up if you can help it! Art image measures of 12� x 18� and is signed by John Romita at the bottom! ALL HIGH end pieces of art, including this one, are able to be purchased with VERY fair time payment plan options, and trades are always considered towards this and any other pieces of art on my site here! Just send me an email and we can try to work something out.